Love is one of our strongest biological drives, but it can be frustratingly elusive and misunderstood. Music, literature, and movies are filled with common folklore about love and millions of TV viewers tune in to shows like The Bachelor and read the latest relationship tome with one simple hope: to uncover some nugget of mystic wisdom that will help them understand the exciting, addictive, insane experience called 'love'. Men Chase, Women Choose, is the first book to offer cutting-edge research that explains how the brain works when two people first meet, start to date, fall in love, and then move into long-term, real love. Maslar's unique approach brings together the latest and most relevant neurological, physiological, and biochemical research on the science of love while incorporating stories and examples of composite characters based on participants of her popular classes and seminars. She explains that 'love' is actually neural activity as well as the presence or absence of certain neurotransmitters that bathe the brain, and it follows a precisely timed path of four, easy-to-understand phases: the exciting norepinephrine-charged meeting phase; the addictive dopamine dating phase; the insane falling-in-love and losing your mind phase; and finally, the safe, warm and wonderful, true, long-term love phase. For the past decade Maslar has made it her mission to learn all she can about the science behind falling in love, including its evolutionary benefits. Her goal—and the purpose of this book—is to help men and women find and maintain love by understanding and applying the science behind it. The bottom line? We actually can have long-lasting, nourishing, exciting, passionate love with little or no risk! I looked up to see a beautiful blond woman with familiar green eyes. Her voice cracked as she held back her tears. 'I thought I did everything right, but here I am again,' she said. Her name was Jessica, and we'd originally met when she came to me for relationship coaching two years earlier. She had a frustrating and almost predictable relationship pattern. She would meet an amazing man, and the relationship would start out with wonderful promise. But when she dated, she would get crazy. Her anxiety level would increase and she would either jump into a sexual relationship where she fell in love but he didn't, or she would pull away, finding some flaw or perceived mistrust in him. The details of each relationship were different, but eventually a glaring problem would arise. She told me the first man had lied, the second worked too much, and the third chatted with women online. Now she was here again, looking for help. I had worked with her in the past to break her pattern of picking men that were wrong for her, but now another problem had arisen. She was picking better men, but she still couldn't seem to find love. Her problem this time wasn't with men but with herself and the dating process. Love isn't just one thing that you luckily fall into. Finding and maintaining lifelong love is a process with several stages that are biologically different from one another. Because the stages are different, you can feel different emotions during each phase. Most people, particularly women, have trouble with anxiety. As you move along the path to lifelong love, your level of anxiety fluctuates, sometimes to the point of panic. At other times, your anxiety is gone, and you feel euphoric. This euphoric phase is the one that most people associate with love. My goal in writing this book is to explain what happens on the path to lifelong love. I'll point out the twists and turns as well as the potholes, the places that can cause trouble and hurt you. When you understand the science of love, it will help you easily and effortlessly find nourishing and passionate, long-lasting love. ©2016 Dawn Maslar. All rights reserved. 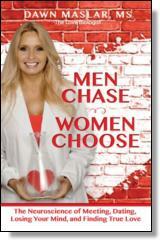 Reprinted from Men Chase, Women Choose: The Neuroscience of Meeting, Dating, Losing Your Mind, and Finding True Love. No part of this publication may be reproduced, stored in a retrieval system or transmitted in any form or by any means, without the written permission of the publisher. Publisher: Health Communications, Inc., 3201 SW 15th Street, Deerfield Beach, FL 33442. Dawn Maslar, MS, is an award-winning author, adjunct biology professor and the go-to authority on the science of love. She is a contributing author at scienceofrelationship.com, a collection of the leading experts in the field of scientific relationship research. She is a TEDx speaker on How Your Brain Falls In Love and worked with the TED Education division to create their Science of Attraction video. She was voted one of the Top 20 Most Followed Dating Experts on twitter and Best 28 Dating, Marriage and Relationship Blogs in the UK to follow in 2015. Her work has been featured on South Florida Today, Pittsburgh Tribune and NPR.